One Cartridge not a Box! 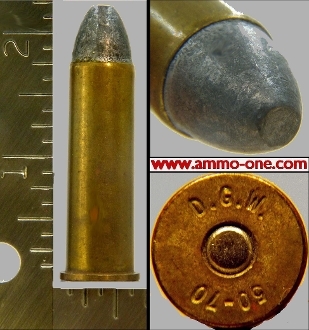 : .50-70 Government, Custom loaded using Dixie Gun Works brass with “D. G. W. 50-70" Head-Stamp and Long Seated, Lead Projectile. Minor spots. The 50-70 Musket or 50-70 Government was adopted by the U.S. Military in 1866 making it the first center-fire cartridge used by the U.S. Military. Retired by the U.S. Military in 1873. It has been obsolete for many years, which means no longer produced by the major manufacturers, like Winchester, Remington and Federal, however it has been produced by a few smaller manufacturers in limited amounts today .